A cultivar of Camellia japonica L. The flower is a glowing blush, some 9cm across, the somewhat pointed petals being recurved towards the outside. [ICR, Don]. 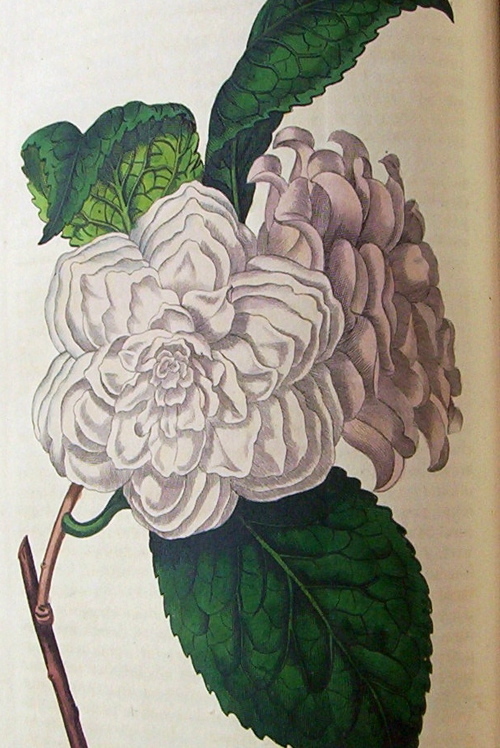 ‘Flower three and a half inches in diameter, full, arranged in a star, of a carnation color, pale on opening, and soon after becoming of a dingy yellow, a shade above No.3; petals imbricated, tufted, slightly acuminated, sometimes crenated at the summit, gently leaning on each other, and forming a kind of star.-Magnificent.’ [Berlèse Monography p.83/1838]. ‘This very elegant variety was first introduced by the late Lady A. Hume, about the year 1806; hence it has been generally known by the name of “Lady Hume’s blush”. […] Twelve distinct sorts [of Camellia japonica] are at present cultivated in this country. They have all been originally imported from China, where it is said that several more kinds exist.’ [LBC no.140/1818]. ‘A fine and beautiful flowering variety, and well deserving of cultivation; but requires often to be pruned, or it becomes straggling in growth.’ [ABR pl.660/1814]. It was also figured as the ‘Blush camellia’. [BR f.112/1816]. Listed in all published catalogues [T.234/1843]. Plants of ‘Camellia Buff’ were presented to the Sydney Botanic Garden on October 24th 1846 [RBGS AB]. This is probably ‘Incarnata’. Macarthur sold plants to Bailey and sons of Adelaide in 1853. Incarnata is listed in both the 1830 and 1836 editions of Loddiges’ Nursery catalogue, copies of which are held at Camden Park [CPA]. In the 1836 edition it is marked with a ‘c’, which denotes grown at Camden. In the 1830 edition there is a dash next to the name but the meaning is not clear. Incarnata was also marked ‘x c’, indicating common or long grown in the Colony and grown at Camden, in an article by ‘G.A.L’ in the Horticultural Register. Although this book originally belonged to James Bowman, it is likely that it was grown by the Macarthur family earlier than 1843. [HR p.633/1832].